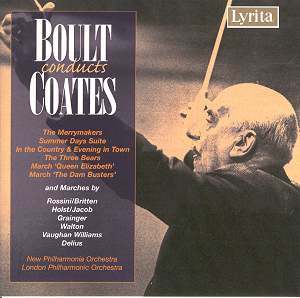 How good to welcome back the Boult Coates album from Lyrita, coupled here with a rather heterogeneous selection of a half dozen other marches. Boult wasn’t averse to the odd march, nor guest-conducting unlikely aggregations – he once conducted Glenn Miller’s band I seem to remember. Still, an album of Coates material wasn’t necessarily the first thing to spring to the programmatic mind back in 1976 – so retrospective thanks are due to Lyrita. Maybe the idea was planted by the Coates performances Boult had given with the BBC Concert Orchestra the previous year, about which I’ll have something to say in passing, as the running order for Lyrita pretty well matches those earlier pieces. There’s no doubt that Boult, whilst sumptuously recorded by Lyrita, was not quite so bracing and incisive as he’d been the previous year. The Merrymakers Overture is captured in rather rawer but more immediate sound by the BBC engineers on a now deleted disc, BBCRD 9106 - one of the Radio Classics series. On Lyrita he is mellow but affectionate; for the BBC he swaggered and was more boisterous – the live performance doubtless driving him with greater tensile strength. In the single example from the Three Elizabeths Suite we again find that whilst the BBC recording is neither as warm nor as detailed as the Lyrita the BBC trumpet solo is more exciting; for Lyrita the trio is much slower and more nostalgic – beautiful of course on its own terms but perhaps missing the necessary connection to the more vigorous material surrounding it. Incidentally I’ve retained the Princess Elizabeth title which is as it was in 1944 – maybe Coates changed the designation post 1953; Lyrita print Queen Elizabeth. Boult had a penchant for the Dambusters march, once playing it as an encore, to everyone’s amazement. He’s tighter in 1975 than for Lyrita once again – the counter-themes are more athletic and the air is more spruce, and more adrenalin fuelled. His tempo for the first and third movements from the From Meadow to Mayfair suite is rather reminiscent of Coates’s own in his 1931 recording with the Light Symphony Orchestra. Summer Days Suite was a favourite of Elgar’s and its central movement is especially lovely, and played by Boult with felicitous distinction. The Three Bears Phantasy is only very slightly longer than the composer’s own 1933 disc with the New Symphony – though Coates has a natural way with the swing of the rhythm that Boult hasn’t. The best of the ancillary marches is without question the Holst, and Boult sounds entirely at one with the music – it’s truly exciting as well. The VW is a close second in terms of interpretative insight and awareness – splendidly florid in its folkloric impress. The Walton is rather deadpan, the Delius very early and not especially distinguished as a work – though it does reminds us that Boult conducted the premiere of the Delius Violin Concerto back in 1919. This is a fine restoration though I can hardly pretend that I admire these more thoughtful and nostalgic Coates performances more than the live ones of the previous year. Toward the end Boult’s live performances and broadcasts could really flare into life and something of that happened in June 1975. But if you accept that this Lyrita constitutes a mellower and beautifully recorded collection than you will certainly not be disappointed.